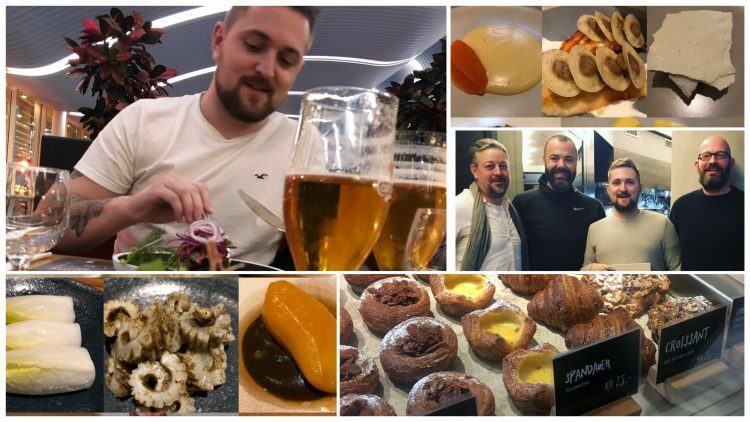 After winning Chef of the Year in 2018, I had waited patiently for my gastronomic trip with Adam Byatt (Chef Consultant) and Pete Redman (Chef Director) to Copenhagen. Copenhagen is an amazing Nordic city. The smiley people are full of life, with not a care in the world. And to my delight it wasn’t as cold as I’d expected! On the first day, we dumped our bags and headed out for lunch. We walked around the town, debating what and where we should eat. We found a restaurant that served herring. Pete and I settled down to enjoy a fabulous pan fried dish with rye bread, potato salad and capers. Adam had the same as me but his herring was pickled. After sampling Adam’s herring I wished I had ordered it too. It was nice to try herring for the first time, and cooked in two different ways. In the evening we sampled our first restaurant – Relae. After hearing about it from other chefs and reading about it, this had always been on my list of places to go. The service and food just made me want more. What stood out for me was the ‘farm of ideas’ goose and onion and the celeriac parfait. The nice touch of a cutlery drawer in the table meant we had cutlery ready for all our courses. Relae will stay in my memory for a long time. The next day we walked through the town to visit Hart Bageri Bakery. Co-founder and owner Richard Hart is the ex-Head Baker for Chad Roberts, (co-founder and owner of Tartine in San Francisco) and opened Hart Bageri Bakery with backing from Rene Redzepi. Reni is the co-owner of the two-Michelin starred restaurant Noma. Hart Bageri works closely with Noma and produces their bread. Hart Bageri’s amazing coffee and a fabulous selection of pastries and Danish sweetbreads were the perfect start to our day. At lunchtime we headed to Geist restaurant. We enjoyed the ricotta gnocchi with enoki mushrooms, followed by wild duck, pumpkin purée and chestnut. We finished off with a salt baked pineapple, wrapped around pineapple sorbet balls. Pete had the baked celeriac with condensed buttermilk, scallops and chicken wings with lobster sauce. He finished with salted wasabi cream toffee. Adam had Puntarelle salad with almond and jalapeño, turbot with fennel ravioli on gruyere. He finished with blue Stilton and chocolate. The amazing flavour combinations definitely piqued my interest. As we were about to leave, Bo Bech stopped me and gave me a signed copy of his book, called ‘In My blood’. It included all the dishes from his restaurant, and some from that day’s menu. That evening we visited our final restaurant, Kong Hans Kaelder. A French cuisine restaurant that received its first Mitchelin star in 1989. They use only the finest ingredients, including oysters with lingonberry, quail’s eggs and caviar, scallops, truffle, butter and cream. It was a luxurious meal, especially with the fine wine Adam recommended. It was the trip of a lifetime. I will remember it forever. Without the bartlett mitchell Chef of the Year competition I would never have had this experience. And it will keep me pushing myself for more.